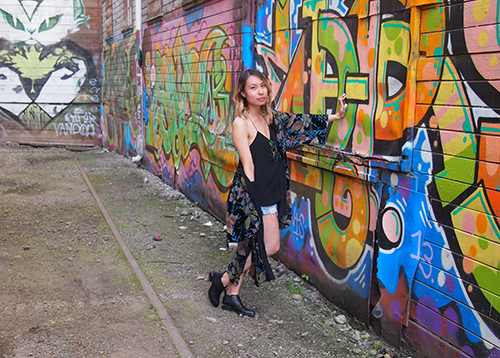 I mentioned last post that I wished we had an alley like Clarion Alley in San Francisco. Well, I've found one right here in Vancouver! Although, I do have to thank Melissa from House of Hudson for this find. Melissa is a local jewelry designer who crafts exclusively with square sterling silver wire. Her pieces are heavily inspired by symbolism and are uniquely detailed... honestly, I've never seen anything quite like them. 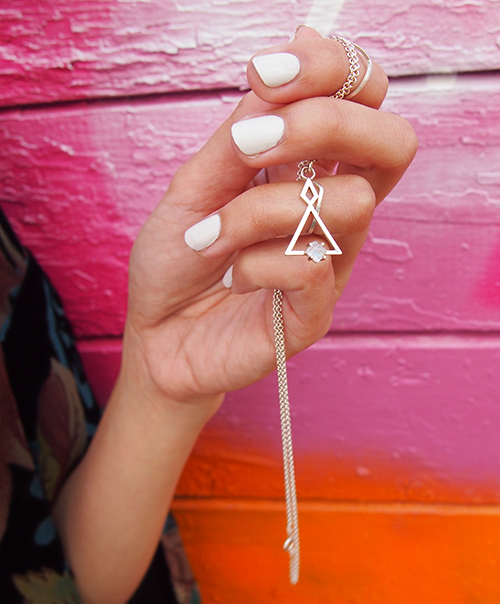 I'll be sharing a few of my favourite pieces over the next week or so and first up is this gorgeous moonstone necklace. Isn't it so pretty? House of Hudson can be found at Le Marché St. George, which is also hosting a summer pop-up shop until May 10. Be sure to check it out if you're in Vancouver but if not, some of Melissa's pieces are also available in their online store. I agree! I think it's when the graffiti is there on purpose like this alley, which is in an artist neighbourhood. You look so amazing pretty girl!! Beautiful necklace.Love the graffiti wall. I love that pretty necklace! The kimono is so fun too!